Well, I’ve just come from a screening of Calvary, the most “Christian” film I’ve seen in as long as I can remember. I don’t think it will be winning any awards from the Christian world (although I guarantee it will show up on my end-of-year list here at Christianity Today, and a few others, too). It has bad words, and it takes place in a universe very like ours — that is, in one where people are suffering the ugly aftereffects (and sometime during-effects) of their very serious sins against one another. …the end, when admiration grew into deep gratitude. The more I reflect on it, the more I’m certain that this will remain one of my favorite films of 2014. John Michael McDonagh’s movie has its weaknesses — primarily in its resemblance to UK comedies about country communities full of colorful characters; you know, shows like Ballykissangel, in which characters who reveal more than one character trait are the complicated ones). But the movie’s strengths are remarkable and, in the case of its lead actor, formidable. I have a feeling that its reputation will grow, and that critics’ respect for it will deepen over time. I meant to write you a review. I knew it would take a lot of time and attention. And… well, I haven’t found the time and attention that the film deserves. So instead, for now, I’m going to share the reviews and commentaries that resonated with me (with thanks to J.A.A. Purves, who shared some of these links at ArtsandFaith.com). Calvary stands as one of those steady, respectable films Christians point to as good storytelling with a thoughtful spiritual telos. “Finally… a film somewhat sympathetic to the faith and not utterly embarrassing,” they might say. Such films — far too few of them — are usually carried by a stellar leading actor, and the rest of the film’s elements (the formal and technical dimensions) stand as modest complements to the lead performance. The budgets are modest, the artistry serviceable (less than brilliant and occasionally flawed), and the director is smart enough to lay low, leaving the central performance and script to shine unencumbered. Robert Duvall’s The Apostle is one example. Calvary is another. There is nothing particularly remarkable about the artistry of the film, but one must respect that as humble and wise restraint in the wake of Brendan Gleeson. It’s his film, his cross to carry, and he does so, admirably. I may have never seen clerical life portrayed in cinema with such a sense of realistic nuance as that found in the writer-director John Michael McDonagh’s Calvary, for my money the film of the year, in which Brendan Gleeson’s Father James stands rock steady and open – he’s enormous and strong, microscopically interested and tender, a believer and a doubter, a Santa Claus with a salty mouth, as if Mt Rushmore had a sense of humor or the Grand Canyon could weep. Is it possible for a film to capture the horror of the sexual abuse scandal in the Catholic Church while at the same time presenting a case for the necessity of the institutional priesthood? Against all odds, this is exactly what Irish director John Michael McDonagh’s Calvary manages to do. [Calvary is] a surprisingly complex, if imperfectly executed, meditation on the nature of sin and mercy, set in the epicenter of the sexual abuse scandal. An essay at First Things went so far as to suggest that Calvary made “a case for the necessity of the institutional priesthood.” That’s probably going too far, but certainly the film proposes that a religious vocation lived with integrity offers not only a viable path for a life well lived, but one that can be of genuine service to others if they are open to it. … Plaiting strands of drama with gentle black humour, McDonagh has created a solid platform for the superlative Gleeson whose soulful, grounded presence is a compelling guide for a rich insight into the small coastal village inhabitants’ sins and virtues. Like the pull of a quicksand, the deeper we tread, the more we are sucked in; this is a complete work that beautifully showcases life’s contradictions and complexities. Calvary is at its best, to my mind, when it eases up on the quirky supporting characters and grapples with Father James’ religious crisis head on. Should he expose the parishioner who threatened him? (Although the audience doesn’t know the man’s identity, Father James recognizes his voice.) Should he offer himself up as a sacrifice, as an acknowledgment of the sins of the church? Should he give up on the priesthood altogether? 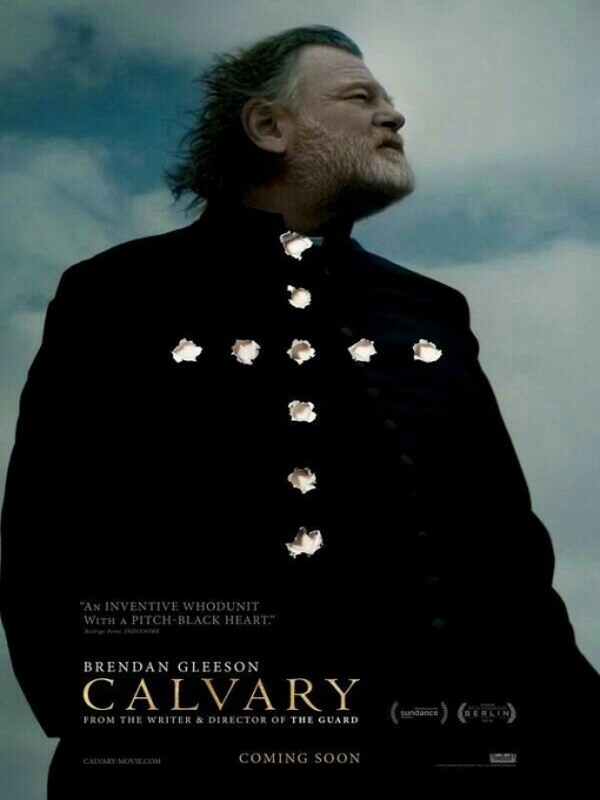 With Gleeson doing the wrestling over such rending questions, Calvary has all the character it needs.